Pound Sterling is off this week's multi-month highs against the Euro as much of the good news that drove the currency higher over recent days is now considered to be 'in the price', and strategists suggest a short-term period of consolidation might be due. "We remain hesitant to engage meaningfully with GBP until more clarity emerges. A positive resolution would focus the market on GBP's attractive valuation, policy potential, and overhang of short positions," says James Rossiter, foreign exchange strategist with TD Securities. The Pound-to-Euro exchange rate is quoted at 1.1662, the week's two-year high is at 1.1722. The decline in the exchange rate has strategists at Dutch banking conglomerate ING Group saying the pair has reached something of a ceiling, citing the successful voting through of the second Cooper amendment in the mid-week parliamentary session as exhausting a run of good news that will ultimately put a near-term cap on Sterling. The passing of the Cooper amendment makes its extremely unlikely that the UK will fall out of the EU without a deal on March 29, since it gives Parliament the power to vote for an extension to Article 50, in the event Theresa May fails to get her own deal across the line at the ‘last chance saloon’ meaningful vote by March 12. 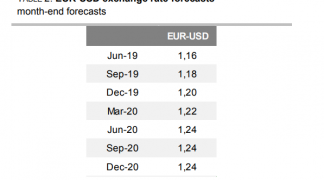 According to ING, only another “meaningful catalyst” would likel push Sterling above a hard-ceiling at 1.1780 for GBP/EUR; or below an equivalent 0.8500 level for EUR/GBP. The current market level at the time of writing is 1.1662 for GBP/EUR, with the week's two-year high set at 1.1722. EUR/GBP is at 0.8576 with the week's low at 0.8530. Given that the one thing there is a majority for in the House of Commons is that the UK should not leave the EU without a deal, it is unlikely MP’s won’t vote for an extension to the Article 50 process should May’s ‘deal B’ fail. The Cooper amendment effectively takes no-deal on March 29 off the table as a realistic scenario; the relief felt by markets has been reflected in the recent surge experienced by the Pound. Yet the removal of no-deal from the equation appears now to have been mostly priced in, and this has created a new limit for Sterling above which it is unlikely to go without just cause. "The recent GBP rally did run into resistance after the Brexit votes in the UK Parliament," says Austin Hughes, an analyst with KBC Markets in Dublin. "Sterling fell prey to modest profit taking. High profile Brexit headlines are receding as backstage negotiations between the UK and the EU continue." Daniel Trum, a strategist with UBS, meanwhile cautions "against chasing that rally" in Sterling, saying "downside risks for the British pound remain in place, and hedging those over the coming weeks and months should still be preferred. Sterling's moves still wholly depend on political news, while economic fundamentals remain on the back burner." "The recent price developments of the pound reminds us of FOMO, the fear of missing out. The current lack of trends in other major currencies probably exacerbates this problem, as it makes Sterling's moves stand out. We think the recent uptrend in the pound was mainly driven by short-term speculative investors," adds Trum. Petr Krpata, chief EMEA FX and IR strategist at ING in London says "we need more catalysts. With the UK parliament now having the chance to stop a no-deal Brexit should Prime Minister Theresa May’s Brexit deal fail to reach a parliamentary majority (by 12 March), any EUR/GBP break below 0.85 is unlikely this week”. EUR/GBP at 0.85 gives a ceiling of 1.1765 in Pound-to-Euro terms. The most likely scenario for the Brexit roadmap from here is for an extension of Article 50, says James Smith, an economist and Krpata's colleague at ING's London unit. Smith still thinks May’s ‘deal B’ will probably fail to get a majority by March 12. Although there has been some talk of hard-Brexiteers shifting their stance to support May’s deal because of the threat of an extension scuppering the whole Brexit project altogether, the gap between what they (the ERG) want and what the EU is willing to give on the backstop, for example, is still too wide to suggest she can bridge it in time for the meaningful vote. As such she is still more likely to lose than not. This leaves Parliament probably voting through a delay on March 14 (after rejecting no-deal on the 13th). The key factor for the economy and the Pound in the event of a delaying of Brexit is the length of that delay, as discussed in another piece here. 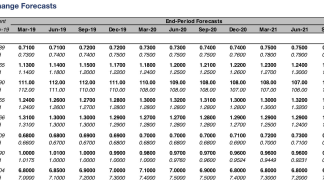 From a currency markets perspective, a delay is good news for Sterling bulls no matter how long it is, but ING suggests a longer delay, defined as 9-12 months or more, is preferable to a short delay, defined as 2-3 months, for the currency. A growing headwind for the Pound is that the longer the uncertainty continues the greater the damage to the economy. “The economy will struggle until we know for sure Article 50 has been extended,” says Smith. In the meantime, over the next two weeks, and until a delay is decided businesses will have to continue to spend precious resources preparing for a ‘no-deal’ contingency. Apart from the cost of preparing for a no-deal scenario until it has been 100% eradicated in the middle of May (assuming this is the outcome) the ‘real world’ cost of Brexit uncertainty is also mounting. “To take one example, a week or so ago the Thalassa Mana container ship set sail from the UK to Japan. Given that the EU-Japan trade deal looks unlikely to be 'rolled over' for the UK in time for 29 March, the firms who have sent the goods on this ship and others like it, have no idea whether their products will be subject to additional customs or administrative costs upon arrival,” says Smith.